Humidity isn’t just uncomfortable: it can also do a number on your home. That’s why it pays to keep the sticky air at bay with a home dehumidifier. Now is the time to get your dehumidifier in order, so here’s what to look for in maintaining your dehumidifier! 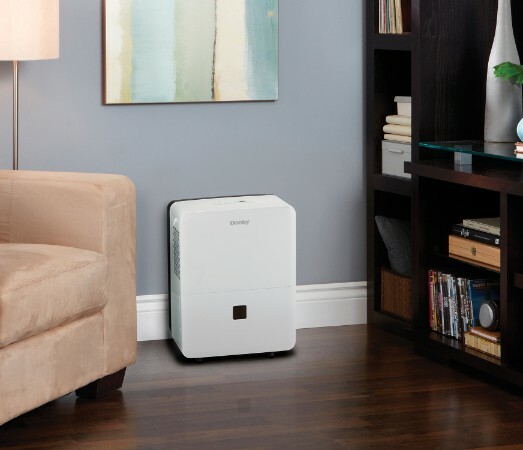 Maintaining Your Dehumidifier: Safety First! Always turn off the unit and disconnect the power cord before you clean or service your home dehumidifier. Even then, you should never pour water directly over the dehumidifier, as this can damage the electrical components inside. We will explain the safe way to keep it clean below. Essentially, a dehumidifier pulls humid air through the intake vent, removes moisture from the air, then exhausts dry air back into the room. It works similarly to an air conditioner, except that the air doesn’t come out colder than it went in. When it comes to maintaining your dehumidifier the main components to look at are the air filter, the evaporator coil, and the water tank. The air that gets drawn in passes through a filter to remove dust and other airborne particles. It then passes over the freezing-cold evaporator coil, which turns the moisture in the air back into water. The water condenses and collects in a water tank. We’ll explain how to maintain these components and keep the exterior casing of the dehumidifier clean. The filter is designed to keep contaminants like dust and pet hair out of the dehumidifier. It’s important to keep that filter clean so air can pass through easily. Depending on the air quality in your home, you should remove and clean the filter every two weeks or so (more frequently if you’re dealing with lots of dust, like during renovations). Follow the manufacturer’s instructions on how to remove it, then wash with lukewarm water and mild dish detergent. Let the filter dry thoroughly before placing it back in the unit. The dehumidifier’s evaporator coil contains refrigerant. At temperatures below 18°C (64.6°F), the surface of the coil may develop a layer of frost. The coil should defrost automatically, but this is still something you want to avoid, as it reduces the unit’s efficiency. Shut off the dehumidifier if the temperature drops below 5°C (41°F). Additionally, you should always keep an 8’’ clearance between the dehumidifier and the walls around it to allow air to circulate properly. Ensuring good air flow will help keep your dehumidifier running efficiently and prolong the life of its components, including the evaporator coil. Most dehumidifiers shut off automatically when the water tank is full to keep it from overflowing. Unless your dehumidifier has a direct drain feature (like many Danby dehumidifiers do), it’s up to you to empty the tank by hand. Follow the manufacturer’s instructions on how to do this. The water that collects in the holding tank is what’s called grey water. We don’t recommend drinking it, but it’s great for watering your plants, since it’s actually less salty than the water that comes from the tap! WHY CAN’T I PURCHASE AN EXTENDED WARRANTY FOR MY HUMIDIFIER THAT I JUST PURCHASED ON JULY 11, 2018. YOUR WEBSITE WHERE I REGISTERED MY HUMIDIFIER WOULD NOT LET ME GET THE EXTENDED WARRANTY..